My rating: 8/10. Excellent watch. Value for money, durable design. Hello, today I’m doing a G-Shock GA-110-1BER review. 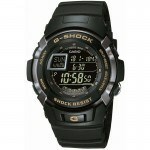 Casio’s G-Shock range are popular for their affordable pricing and durable designs. This is another one of their oversized models that people seem to love so let’s take a closer look at it. If you like this model we have plenty of analog and digital watch reviews throughout the site. I hope you enjoy this G-Shock GA-110-1BER review below. You may also like my 100 best watches under £500 for men. Regular readers will be well aware I’m quite the fan of G-Shock watches, I just think they’ve done a great job of offering customers good value for money, and that’s something that’s important to me. They’re well built, durable, and often full of useful features. The model I’m looking at today is one of their oversized models so it might not be suitable for people with smaller wrists, that being said, let’s take a look at the rest of its features. 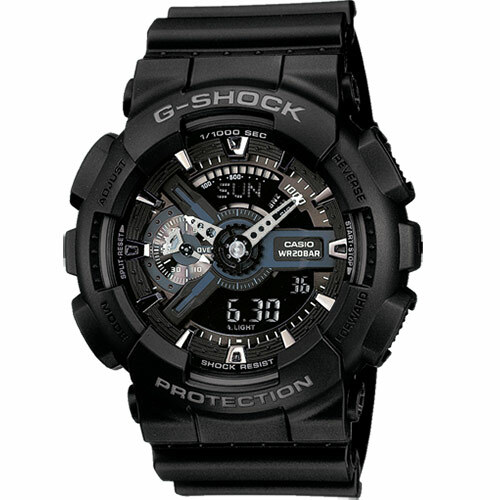 This G-Shock watch has a primarily all black design to it with some white and dark blue highlighting. All black watches have been extremely popular lately so it’s easy to see the appeal of this model. They’ve used a colour reversed digital display, this means they have the white writing on top of a black background which I actually think is easier to read, to be honest. 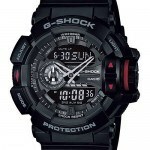 Protecting the dial of the watch we have a mineral crystal glass which is found on many of the G-Shock watches. Mineral glass is specially hardened to resist scratches and it’s excellent for this style of watch due to its shatter resistance. Protecting the watch we have this strong thick resin the wraps around the case, this is what gives the watch its large profile and extra durability. The watch is built to be able to withstand drops and knocks and it definitely achieves this. I mentioned earlier on that this is a fairly large watch, the casing diameter is 55mm while the thickness is 17mm. This makes it an extra large, very chunky watch. If this is something you really like in your watches then that’s ideal, but if you don’t then do keep this in mind. Again these bigger watches don’t always look so great on smaller sized wrists. 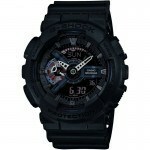 As you find with many G-Shock watches this model is feature rich. These include an Auto-LED light, world time function, stopwatch function, timer, 5 daily alarms, speed display, automatic calendar, 12/24 hour timekeeping, and snooze feature. Inside the watch, we have a standard Japanese made quartz movement. These are reliable, accurate, and affordable. This is found in many of the G-Shock watches so it’s exactly what I expected to find on this model as well. The strap is also made of this thick sturdy resin and has a width of approximately 26mm. This is well suited for the rest of the watch sizing and is a bit bigger than your standard strap. The strap fastens with a buckle style clasp. With an impressive 200m water resistance rating, this should prove suitable to many. 200m or 20ATM ratings are suitable for professional marine activity, serious surface water sports and skin diving. Band Resin strap, standard length, 26mm width, standard buckle style clasp. Case Stainless steel casing with resin surround, sizing diameter: 55mm and thickness: 17mm. Dial Dual Analogue/Digital display. The window lens is made of mineral glass, this is specially hardened to be resistant to scratches and knocks. Movement Accurate Japanese Quartz movement. Water Resistant A water resistance of up to 200m / 20 bar. Mineral glass offers a good level of scratch & shatter resistance. Being an oversized watch at 55mm this may not be suitable for people with smaller wrists. The G-Shock GA-110-1BER is perfect for those seeking your typical big G-Shock watch. If you have an active lifestyle this is great for those who enjoy outdoor activities or who need something sturdier at work. After looking into the watch design, quality, features, and pricing this watch received an 8/10 from us at The Watch Blog. Hope you enjoyed this G-Shock GA-110-1BER review. Find more watch reviews below.